Love. So it looks like you are key to everything. I know I have you but where and why are you hiding? I already pledged before to make you the center of my life, but then I forgot and you haven't reminded me. Or you have? Through new obstacles and downturns? I come back to you and your all-forgiving embrace, and feel calm and peaceful for some time. But then life pulls me away from you with force and I lose that precious connection again, I become a blind person without guidance, bumping into walls, hurting all over. I'm tired of coming back to you through pain, of this constant separation, which - I know, I know - is nothing but an illusion on my side. You are always there for me, softly radiating, - so simple, so inviting. It's me who sometimes pretends like I don't see you, because I'm too confident that everything is under my control. It's exhausting to just date you on and off, I want a real relationship, a marriage. I want serving you, being your tool to manifest what was scripted for me. I want to wake up every morning and feel your presence, like I feel the sun light through my so very sun-proof curtains. I want to breathe in love, and breathe out love. All I really need is to open my doors for you and refuse an impulse to shut them close out of fear, despair or loneliness. There's no need to seek you because you are me, the best part of me in your perfection. I just need to let that side of me be, to stop resisting. Today I would like to let you know that I'm working very hard on connecting. But I have lots of bad habits that won't surrender that easy. Yet I'm on my way and any help will be appreciated. It's in really trying times that our belief system gets challenged. The notions that held true and worked for you for so long crumble like a sand castle from a gust of wind. Your assumptions become scattered pieces, orphaned children unsure of what they are and how they will survive in the ever attacking world. On days without a pattern my thoughts are sporadic and elusive. A book with too many pages on too many different topics: I know I'm somewhere in there but I can't find the exact location. The biggest paradox is that in this process of losing myself I actually find the true me that would otherwise be dissolved in a life race. I am finally given a chance to go so deep that it's beyond scary, strip myself of layers and really see what's at the core. But then again this depth in big doses is suffocating and I constantly need to emerge for a breath of oxigen, of my normal routine, of ordinary things happening and time flowing. Then I'm pushed under all over again until I find the answer to the question I haven't even formed yet. On the outside "me" seems so small, my life is small too, but inside it's a huge massif that I don't even know where to begin decoding. What if I believe something is true and let it guide my life to later find out it was false from the beginning? I'm afraid to commit to any of the learned wisdoms and continue digging in hopes of finding one absolute, unquestionable knowledge that I will engrave into myself. The dull pain that settled in me is there to stay for a little longer. I only pray for a break from emptiness, for a letter in the box, a word in silence, a sentence with my name in it. I try to make sense of things, events, coincidences but connecting the dots seems as useless as picking and interpreting a random card from the deck. It can mean one thing, or another, or nothing at all. If everybody finds their true self and follows their call, who will remain to sweep the streets and guard the prisoners? Maybe it's not about a job after all, like a good actor is not about the roles he is given to play. They say only what's inside matters but without the external events I have no story to tell, and without a story I'm nothing. So I let life shape me, I try on different faces and personalities; some grow onto me, others give me allergic reaction and I'm itching to shed them. Sometimes we are forced to swim from one bank to another. And there's nothing you can do during those long laps but paddle with all your might to get to your destination faster. You could try to do some thinking about life in the process, but eventually you lose sight of how it ought to be until you feel the ground again under your feet. I struggle to maintain a simple conversation because what matters to others seems pointless to me and I lack the energy to fake it. And what matters to me is too blurry and unreal to be expressed by words. I am just a shadow these days desperate to attach myself to something real, something that will define me with real words. I want adjectives. And to be in someone's memories. I wrap my apathy into a neat little package and shelve it along with a similar bunch from the past. I'm a fighter, I have it in me to push forward regardless my pain and despair, I'm wired to go on even when the fuel is almost out. And maybe life doesn't make much sense but until I'm withdrawn from it ,I will keep filling in the gaps with theories of my own making. 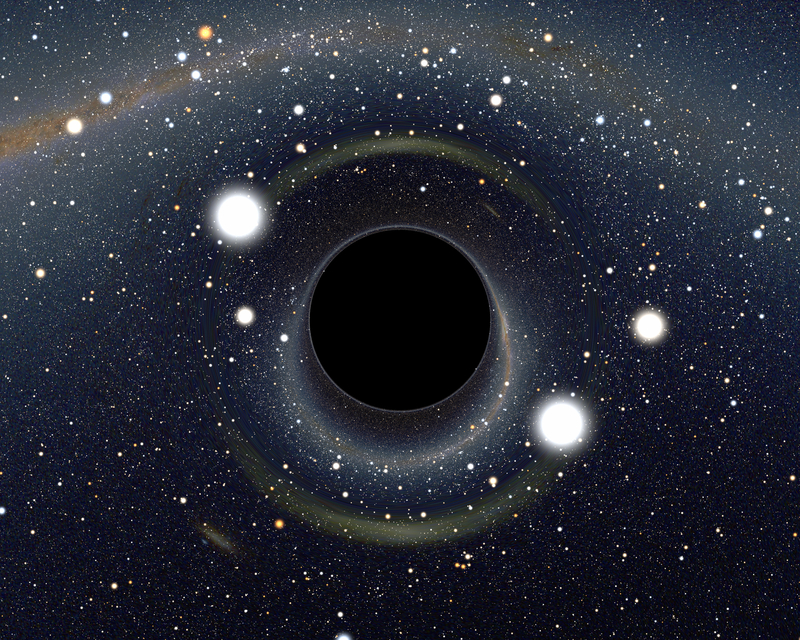 Maybe these black holes appear on our way so as to prevent as from getting into the wrong realm? What if at this given period in life there's no single right option but a multitude of really bad ones, and we are better off stuck in the moment than get too deep and too far along the wrong path? And there's no gentle way to tell us to wait it out, till the sun spins the right number of times, until it's safe to proceed? Or maybe the answer is in the timing and then it's key to develop enough intuition to know with absolute clarity when the right moment comes to take the next step. Until then I give my black hole one last look, suppressing my anger, paying my respects. And then I turn away from it and turn inward. It looks like I have work to do. I love Goodreads daily quotes because every time I find something that speaks to me directly, saying things I so need to hear right now. The quote about finding your voice, obvious as it might seem at first glance, led to the light bulb moment. Yes, I've been searching for my true identity, shedding off layers I've acquired in the years when I did nothing but tried to fit in. Even if at the cost of losing myself. And lately I've been struggling to regain everything I've so recklessly given away. It hasn't been easy - mostly it's two steps forward, one step back. My inclination to speak up my mind occasionally gets pushed back by the old habit to please and say what others want to hear. I vowed not to participate in gossips but can't help my curiosity, when someone suggests "Guess what..." But at least I started moving in the right direction, even if taking baby steps. Finding my voice is similar to that process but it's also different. When you speak in your own voice, the sound vibrates with positive energy and you feel it flow through your whole body. Your voice has the power to always find the right things to say by expertly digging them out from the complex, entangled maze of your thoughts. But the voice knows, the kind of knowing that leaves no room for doubt, the absolute knowledge of "that is so". It can be tempting to suppress your true voice because what it says isn't always to everyone's liking. And it calls out to suppressed true voices of those around you. Some of them will respond with gratitude, others will hide their voice even deeper, unwilling to mess with something as powerful as that, a threat to their comfort. But I want to have the courage to stick with my true voice, because what it brings to the world is compassion, wisdom, light and peace. I want to speak with the voice that soothes, heals and shows the way. So, what's new... I feel like I've made a full circle yet again and came back to where I started. You live with one way of thinking, your peculiar perception system, and then as you get exposed to something new that truly speaks to you, you leave your old beliefs to follow the new path. And as it unravels, as you nod in agreement - "yes, yes, yes!" - the world amazes you with wonders you haven't noticed before. Even though they lay there in plain sight all along. But as you go deeper and deeper into this new knowledge, it gets too condensed, too artificially-sweetened, until you reach the point of paradox, where one obvious contradiction negates the whole approach and everything you've been accepting as real. You are back to square one, too disappointed to bring from the journey those couple of points that weren't that bad. It's like reading a book with a stellar beginning that soon turns into trivial, amateurish writing with a predictable end. Screw the beginning and its alluring promise of great things - it's a one-star read, period. So here's how it goes with me every time I stumble upon an ultra-new, fail-proof shortcut to happiness. First I get all excited and hopeful, abandon all my old beliefs in favor of these newly found wisdoms, experiment daily, eagerly awaiting the awesomely positive results. And then I see how little if nothing changes. Or that this new system skips important concepts if it's unable to bend them to their otherwise universal rules. I feel disappointed, annoyed, mislead, fooled. It's like you were given wings and you are enjoying flying for the first time until the moment you realize the wings are just imaginary, and you are high above the ground and nothing is going to hold you, so the only way for you is to go down with the gravity pull, back to where you were in your pre-wing life. It doesn't mean that I won't keep reading, and pondering, and trying out new ideas. It's just that maybe everything is true and nothing is true, so in the end it doesn't matter what you are thinking, or doing. You will still keep going and it doesn't matter which religion or belief-system support each of the steps you make. You are getting somewhere and there's no way to say if you are in the right spot, of if there's such a thing as the right spot. So, another day, and I may choose to be active and submerge in the pool of activities, busy myself with life-changing acts or curl up with an entertaining book and do nothing else but read. It's just another day and it's been lived. How do You Keep Faith that Things Will Work Out for Your Highest Good? What do I tell someone who's going through a challenging life phase? What if this someone is me? How do I lovingly persuade myself that "this too shall pass"? How instead of getting stuck in the moment and panicking I embrace myself for the obstacles because they are a necessary nudge to shake me up, make me move forward? If you are settled into your sweet comfort, submerged in the haze of status quo, rest assured Lady Fate will come with a huge bat and give you a much needed blow. Before you know it, you no longer gaze sleepily at your possible destiny, you run toward it as fast as you can, before another blow finds you. And it doesn't matter if while on the road of trials you remain strong and keep your face and dignity, or you succumb to the pain and fear, and wail like a wounded animal. The only thing that counts is that you keep pushing forward. Many warriors scream on the top of their lungs as they lead the way into the battle. It helps scare the enemy but also suppress, deafen their own fear. Maybe I too, should give in to panic and yell out "I'm scared", and then repeat it a hundred, two hundred times, till it loses its meaning and power over me. What do I tell myself in this trying times? That I'm given a loving push and, though it hurts now, it will take me to a new place, my next train station where I'll get off and experience life all over again. Things always have a way of working out and someone knows what they are doing, putting me through this obstacle maze. Some days I am stuck. Occasionally I am inexplicably happy, or melancholic, or both. And there are moments of darkness and misery, which I am yet to learn to control. Controversy is the only consistent notion in life. And we will always have too many unanswered questions. But in the end happiness and love are all we really want. I will come here to write about things I cannot share with anyone. Things I am afraid to admit to myself. Feelings I am not supposed to have. Thoughts that I want to let go.